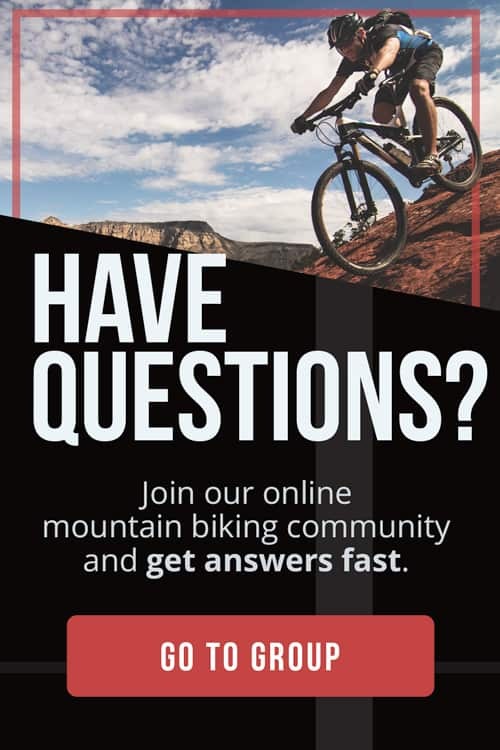 One of the questions we get asked the most is where do we sleep when traveling on our bicycles. 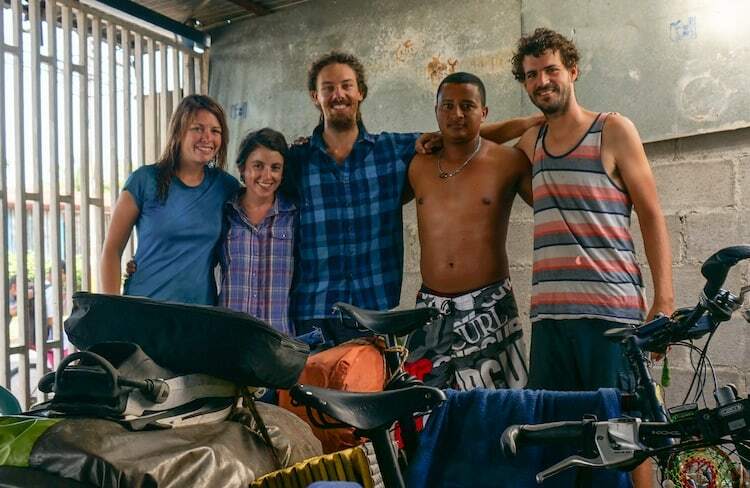 Exploring a country with your own 2 wheels opens you to a new range of opportunities to overnight. Some of them can save you a lot of cash while others can also provide you with a completely different perspective of the place you visit. This is, without any doubt, one of the reasons why I love traveling on my bicycle. So, the next time you hit the road make sure you try some of the places below. I guarantee you won’t be disappointed. 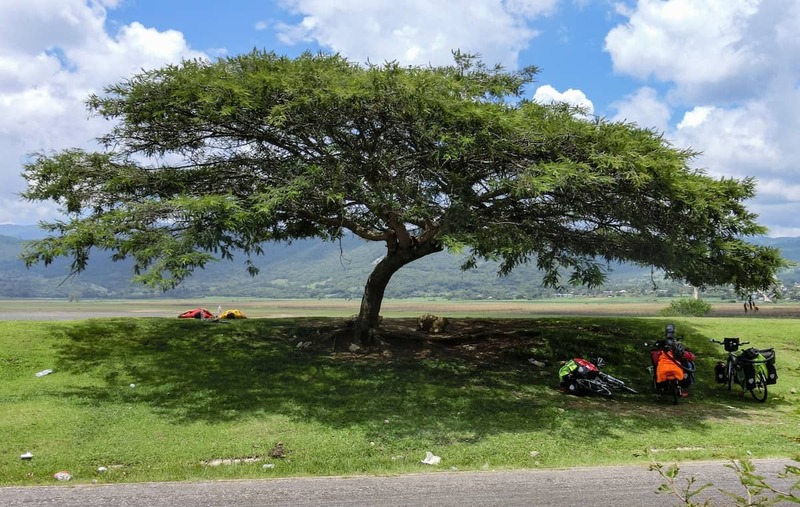 Apart from saving some money you will enjoy another side of traveling on your bicycle with these 14 free places to sleep while bicycle touring. A very popular option, especially if traveling in Latin America. 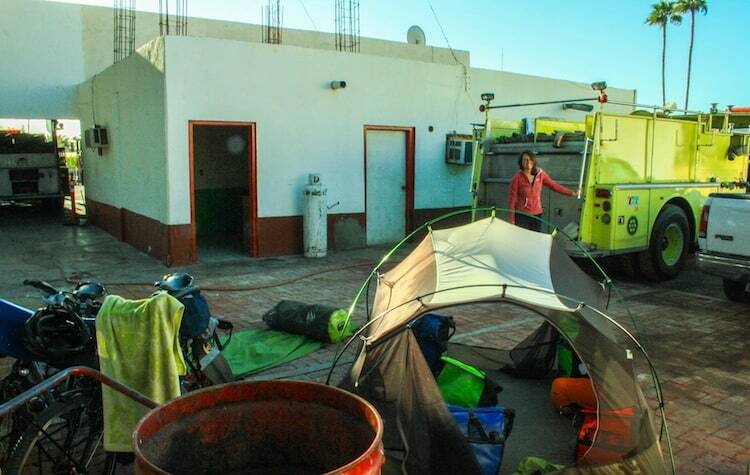 Fire fighter stations are normally well equipped with kitchen, showers, toilets and sometimes even wi-fi! They have 24 hours shifts so they are always open. We found very friendly people working here and they never turned us down, although it’s getting too popular among the community and we’ve heard of some stations not accepting cyclists anymore. It might sound a bit intimidating at first as police hasn’t got a good reputation in some countries, but our experience is always been really good with them. I normally ask them if they know any spot that is safe where we can pitch our tent. Depending on the country they have sent us to other places or let us pitch our tent at their offices. 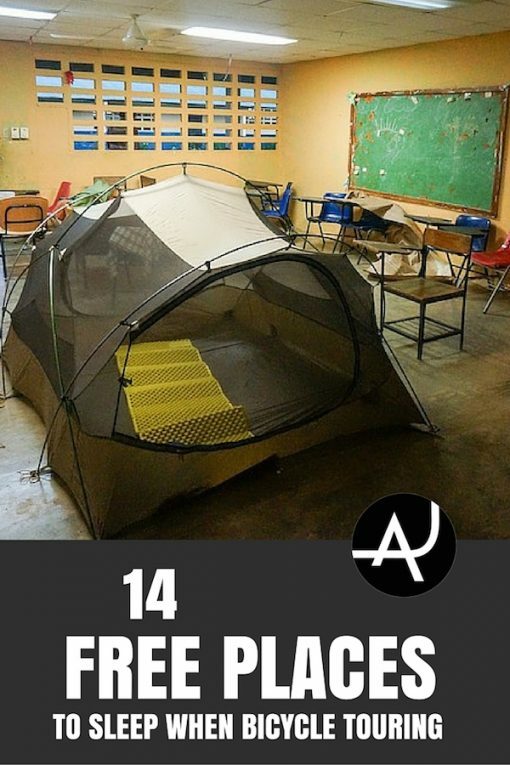 What a safer place that sleeping at than the police station? Similar to the fire fighters option, asking to pitch your tent at the Red Cross facilities is a good option. They are open 24 hours and some even have cooking facilities. The downside is that it can be noisy if there are some emergencies during the night. 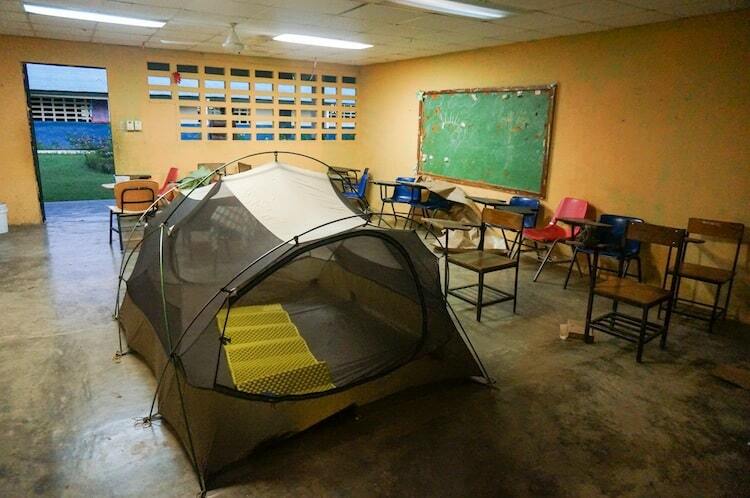 If you don’t mind waking up early, schools can be a great spot to pitch your tent to spend the night. They have toilets but not always showers. Sometimes it’s not easy to find the person who has the key, and the right, to open the school, so that’s why this strategy works better at the smaller towns rather than in bigger ones. Many little towns have some sort of sport courts. They sometimes have changing rooms with toilets and showers, which is a big plus. The only downside is can be difficult to find whoever is in charge to ask for permission to stay overnight. 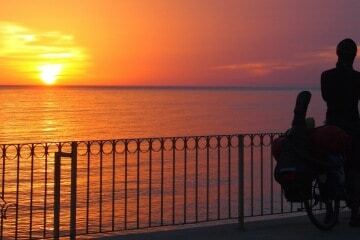 There is normally a night watchman who arrives when the sun sets. 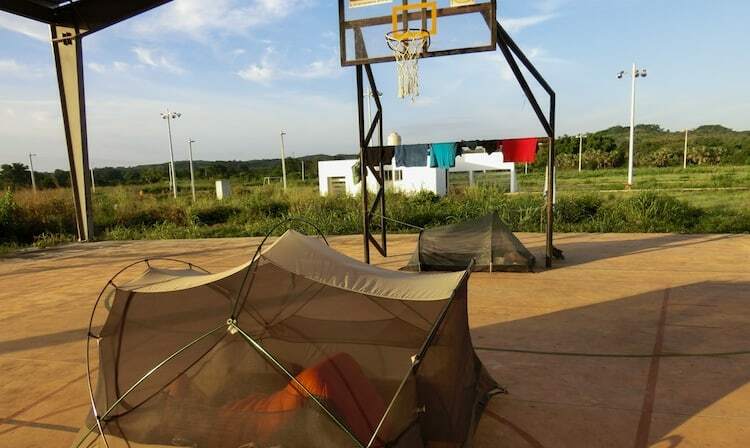 If you are carrying a camping hammock to sleep in, then the goal posts are the place to hang it. It’s a popular option when traveling in Latin America. We haven’t actually camped in a public park, as every time we asked for permission, we were invited to sleep somewhere else. But we know that many cyclists have slept in them without any problems. In some countries, petrol stations have nice grass areas, toilets, store, 24 hours security and sometimes even showers. They are a great place to overnight. The only downside is that can be a bit noisy if it’s frequented by trailers. These two web based hospitality networks are a great resource to find a place to sleep and meet locals of the place you are traveling. 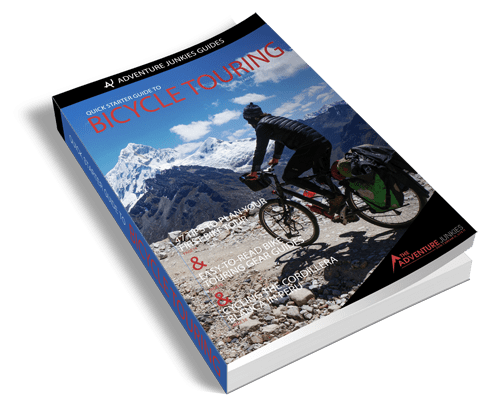 The first one is specific to bicycle tourers while the second one is open to any kind of travels. In our experience, Warmshowers hosts usually know better your needs as cyclists but we have great memories with people from both networks. It’s a hospitality network available around Latin America. 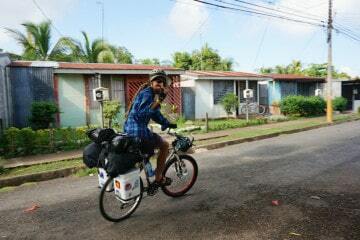 There are houses, normally run by fellow bike tourers, that host cyclists. We’ve met incredible people staying at these places. Our very favourite one is GDL en Bici in Guadalajara, Mexico. You can find a full list of the Casas de Ciclistas here. If you are crossing a long stretch without towns and don’t want to wild camp, asking to pitch your tent on a road side restaurant is also a good option to spend the night. 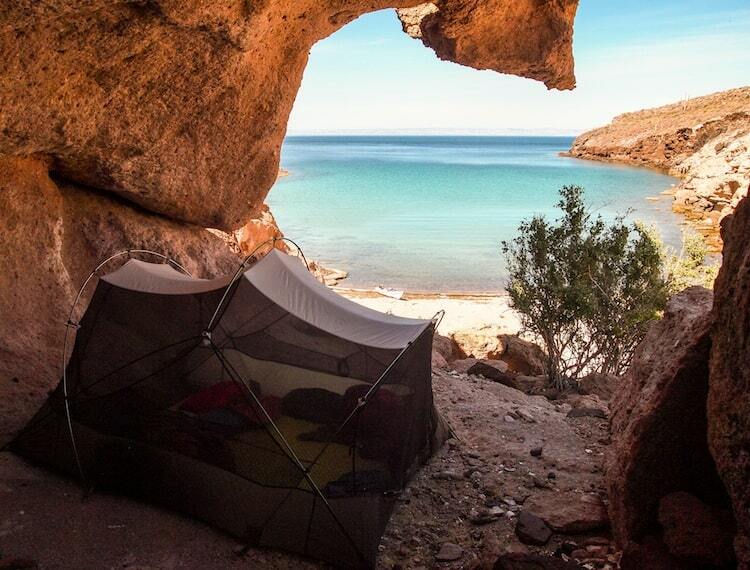 We used this strategy a lot when cycling the Baja California peninsula in Mexico but you can use it anywhere really. 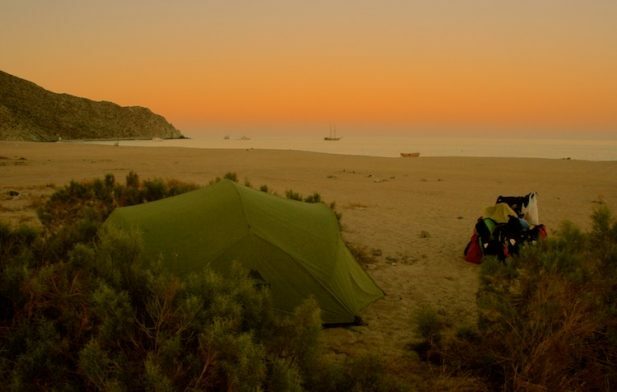 Out of all the wild camping options, camping on the beach is one of my favourite ones. The sea provides you a shower plus a morning swim, it’s easy to make a fire and wash your cooking utensils, and there is always a nice breeze at night. What else could you ask for? 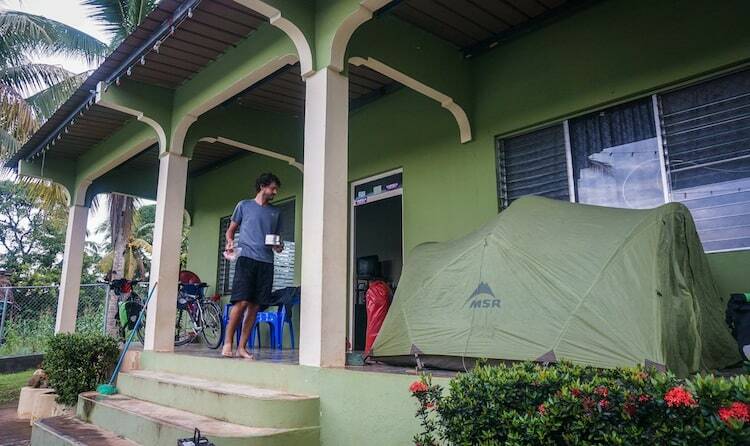 This is one of the newest places we’ve been experimenting with to overnight in Colombia. Tolls are always open 24 hours and have security on spot. Some of them even have bathrooms and small stores where you can buy drinks at the end of the day. Showers are normally not available. If you are in the country side and want to meet some time with the locals, asking to pitch your tent in a farm is one of the best options. Be aware that you will have to be ready for some social interaction, probably answering tons of questions about your trip and meeting several new people. So if you are tired and just want to eat and sleep, you better find another place. But if you feel social and aren’t too tired, try staying with locals. It’s one of the best aspects of traveling by bicycle. 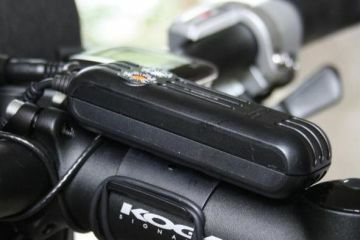 How To Charge Your Electronics While Bicycle Touring?